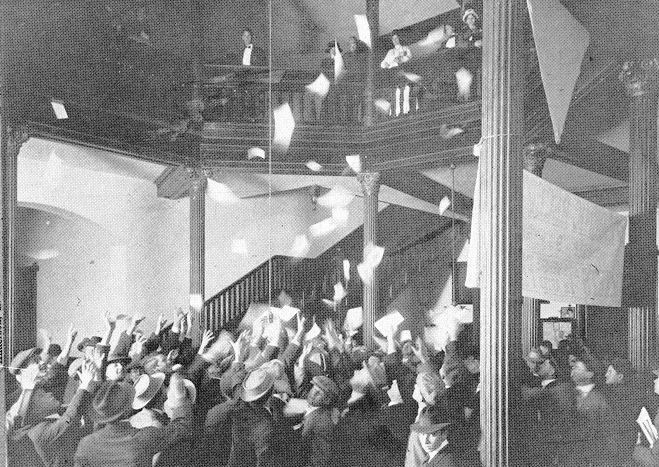 In the early days of the University, before there was a Texas Union to serve as a campus gathering place, students often passed time between classes in the rotunda of the Old Main Building. Located just behind Old Main’s central tower, the four-story rotunda was capped with a skylight. 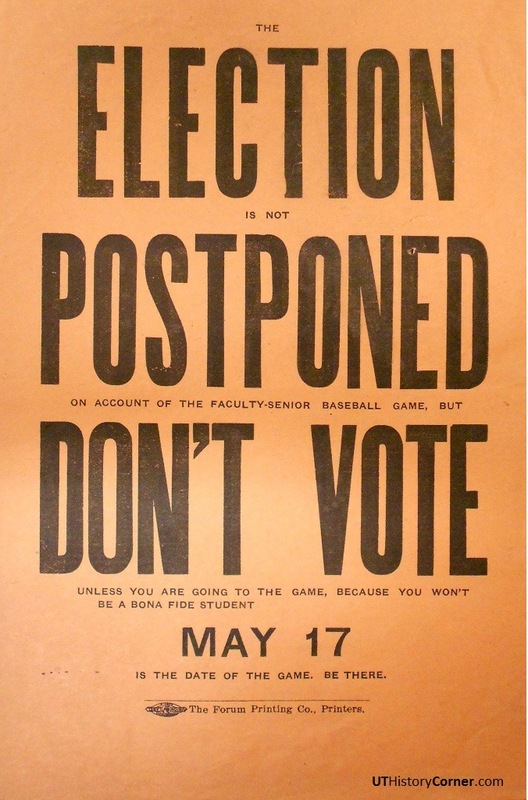 With so many students in one place, announcements about football rallies, lectures, concerts, or campus elections were printed on handbills called “dodgers,” taken to the top of the rotunda stairs, and tossed en masse to the students. Above: A flurry of dodgers drops into the waiting hands of students in the rotunda. 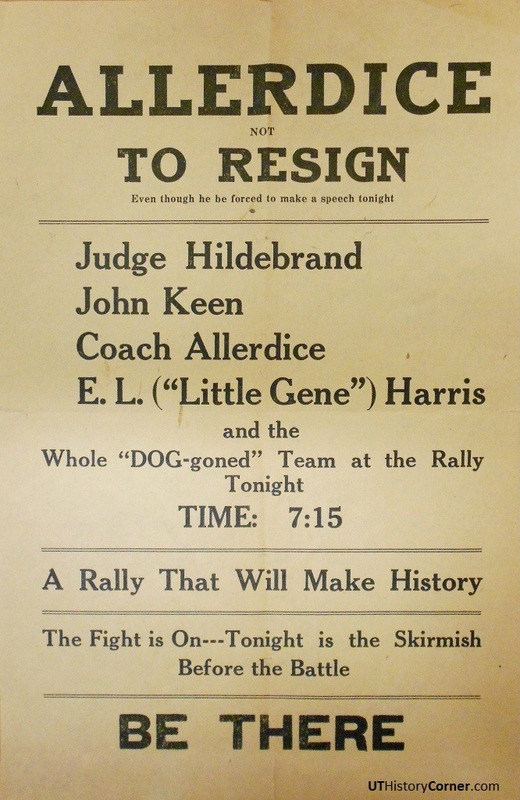 Half the size of a letter sheet (4 1/4″ x 5 1/2″), dodgers were cheaply printed on the thinnest of paper. Most survived only one day, and were either trashed by students or swept away by the campus custodian. 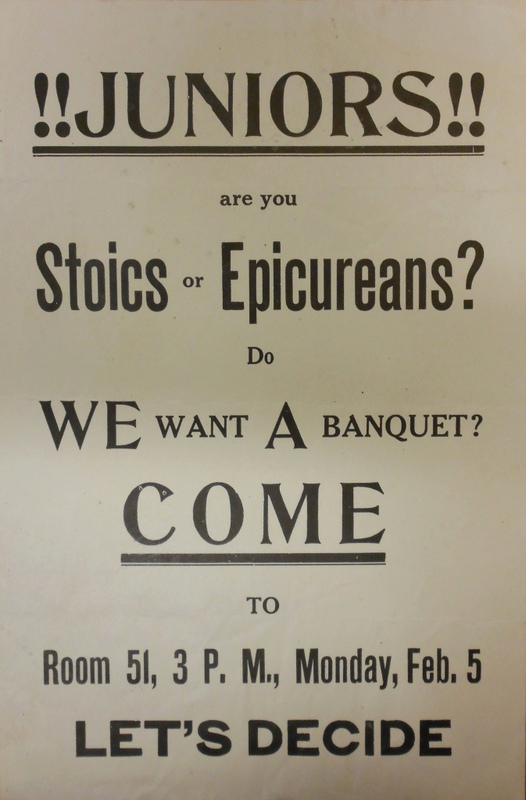 A few, though, have managed to survive, and tell us something of campus life. The era of the dodgers ended in 1913 when, because of growing enrollment, the rotunda was reluctantly covered to create more room. 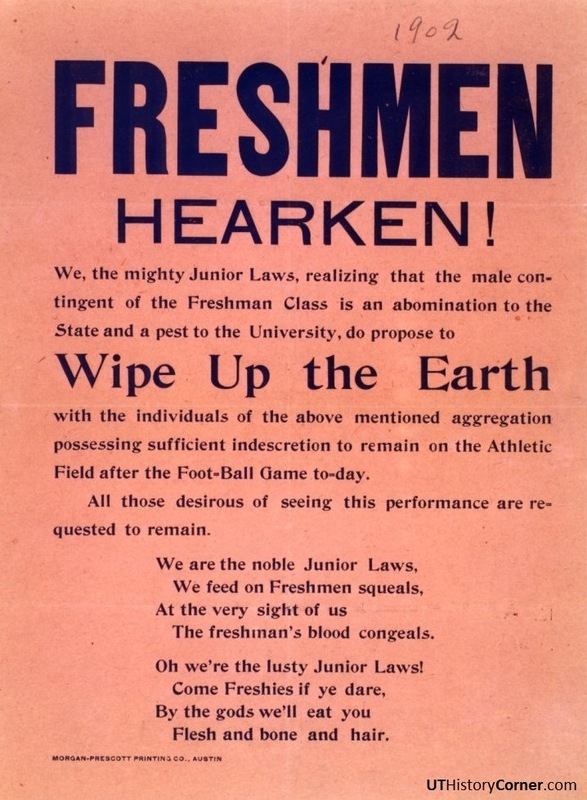 Freshmen Hearken! Today, there are many campus programs designed to welcome new students to the University. 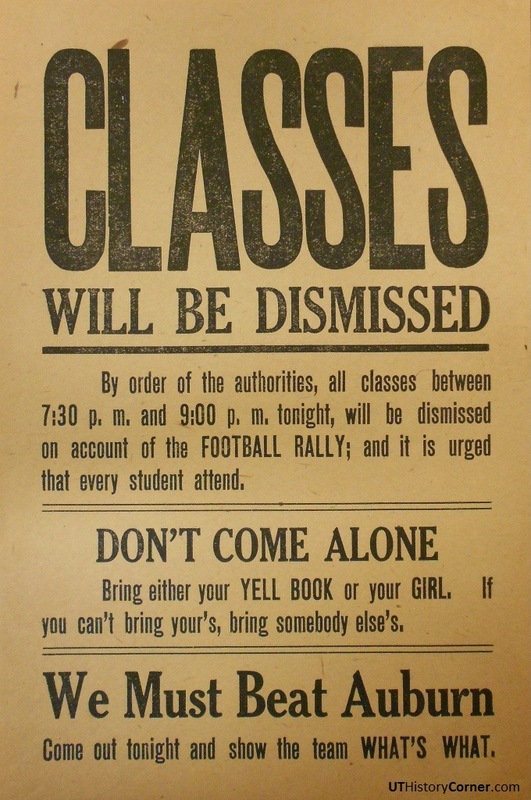 But in 1902, this dodger, authored by junior (first-year) law students, sounded a more ominous tone, and challenged the freshman class to a “rumble” after a football game. 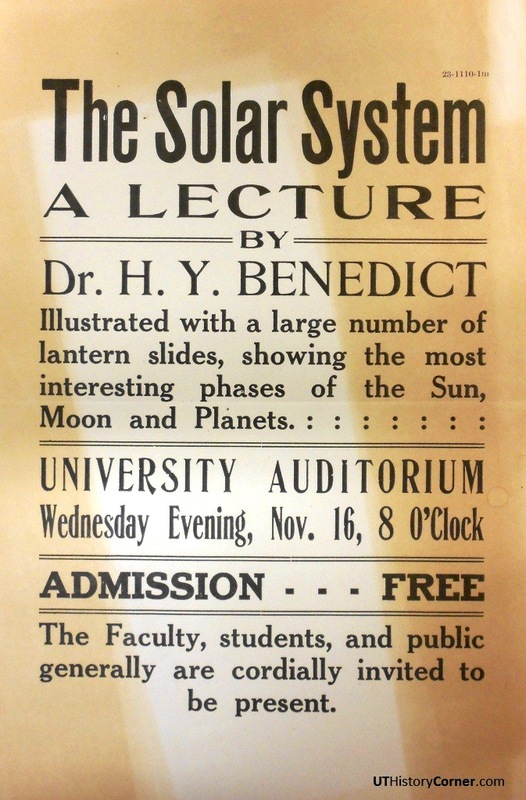 Click on image for a larger view. 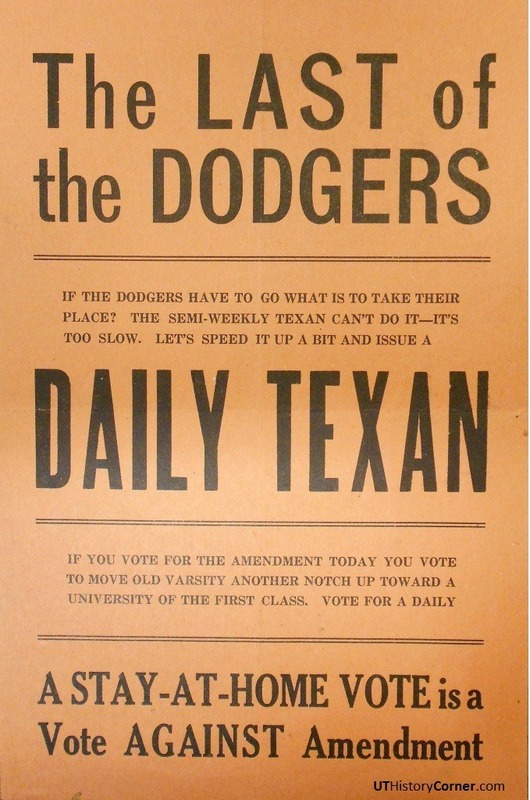 Dodgers had to grab a student’s attention, and the headline, “Classes will be dismissed” certainly did that. But read carefully. 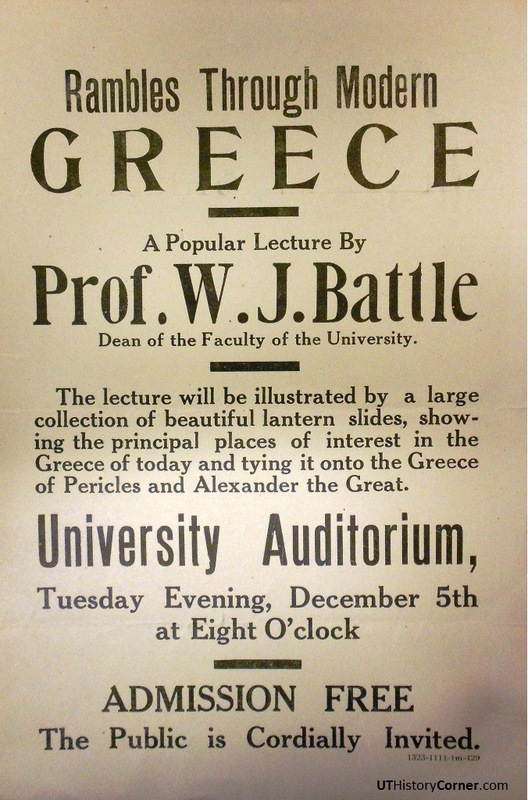 There were never any classes scheduled in the evening. 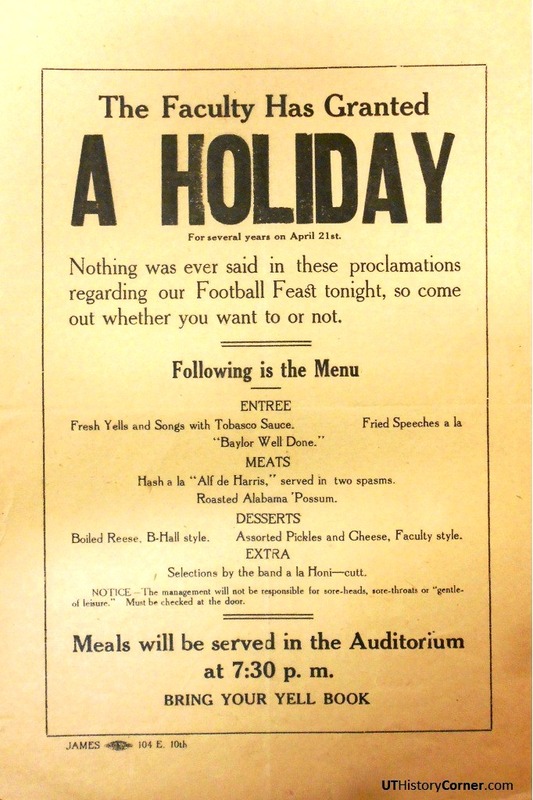 This is really an announcement for a 1911 football rally in the auditorium of Old Main, though, “Bring either your yell book or your girl. 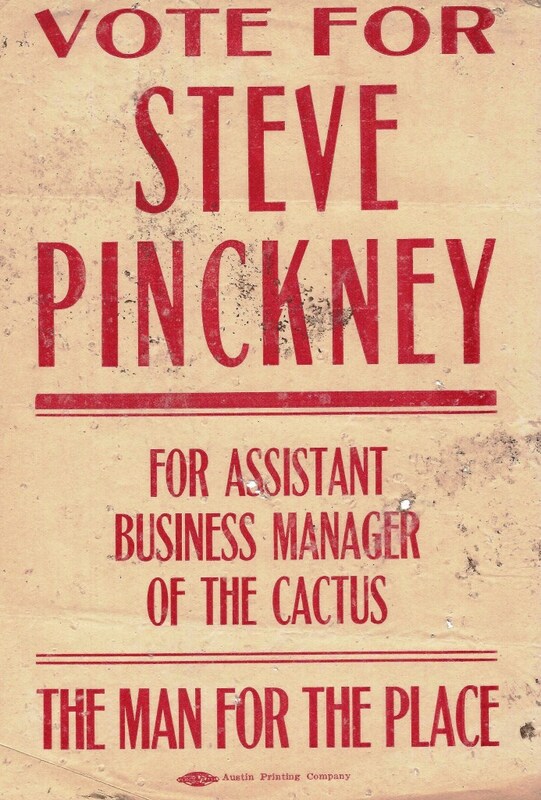 If you can’t bring yours, bring someone else’s” is a little ambiguous. Texas did beat Auburn, 15 – 8. 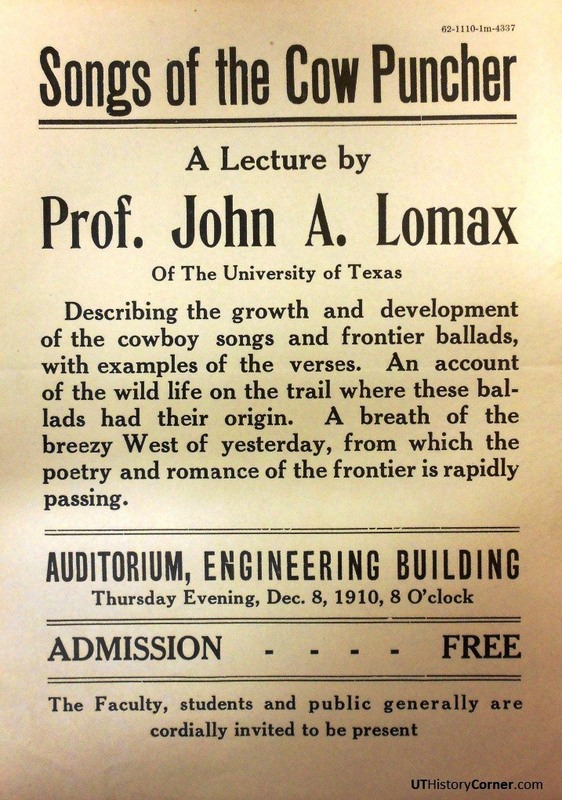 University alumnus John Lomax became internationally famous for his efforts to collect and preserve folk music, and he routinely offered well-attended lectures on the subject. 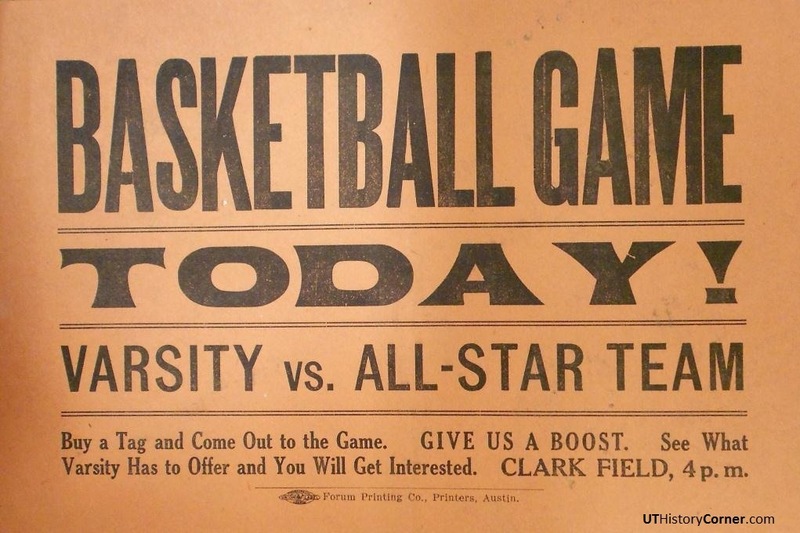 On campus, Lomax was the assistant to UT president Sidney Mezes, and also served as the first full-time director of the alumni association. 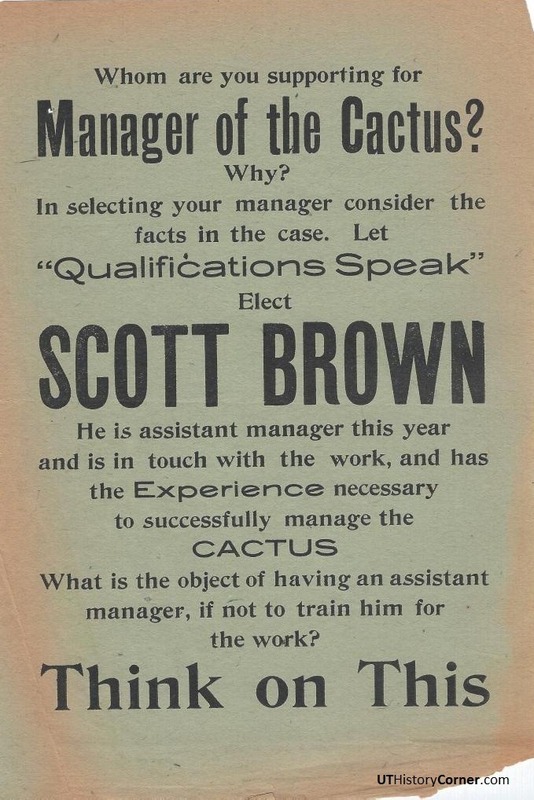 Dodgers were often used for campus campaigns, including this 1910 race for the assistant business manager of the Cactus yearbook. 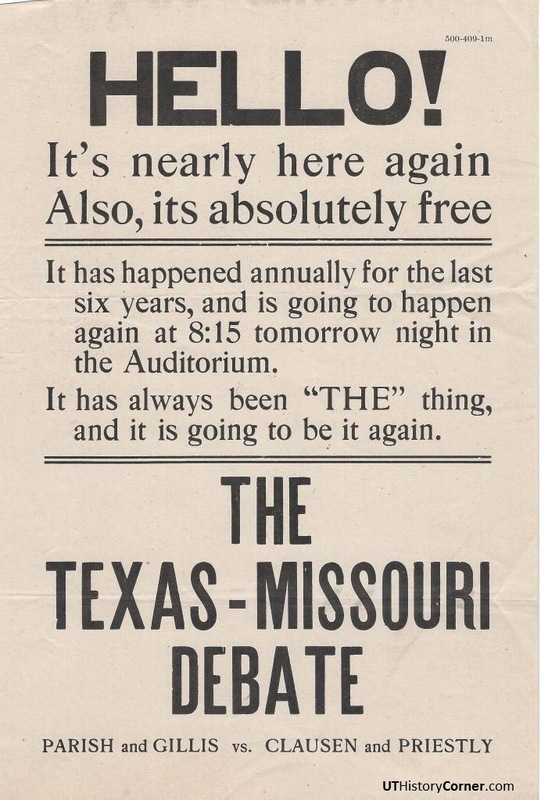 In 1916, a few years after graduation, Pinckney spearheaded the project to purchase a live longhorn mascot and present it to the students. The longhorn became Bevo I.